A quick look back before we move forward: on Wednesday 10 May 2017, a nodal shift happened. Mother Earth rotated from the Virgo-Pisces axis to the Leo-Aquarius and will stay here till 6 November 2018. The South Node represents our collective karma; when ensconced in humanitarian Aquarius, we need to address how we’ve been furthering (or hindering) the progress of the human race. Do we truly believe (and act on the premise) that All Is One? Or are we turning a blind eye to the inequalities and injustices being carried out against underprivileged groups every day? Do we truly believe (and act on the premise) that All Is One? And how shall we respond to the cries of the weak, poor and defenceless in our midst? The position of the North Node (representing the next stage of our collective evolution) gives us a clue. Leo, in its high-vibrational state, epitomises leadership, dignity, courage and generosity. We are called to open our minds, hearts and arms in the service of the greater good. To be the voice for the voiceless, and to navigate our course with courage in an increasingly complex world. We are called to open our minds, hearts and arms in the service of the greater good. Until 6 November 2018, our collective task is to keep our eyes fixed on the prize, and to be consistently mindful of our choices, actions and behaviours. Extra points if you step out of your comfort zone and take action to facilitate human progress: volunteer service, and/or a creative fundraising project? Leo is very into the creative arts (or anything to do with the spotlight, really). Extra EXTRA bonus points if you can take this online and make it a group activity (Aquarius rules technology and communal endeavours): maybe set up a public Facebook page to raise awareness, support and resources for a good cause? This is a precious transformative shift in the Earth’s energies – they all are, in their own ways (even retrogrades!) – so use it wisely. Be careful not to slip into low-vibrational Leo mode (narcissistic, entitled, delusional, selfish); but even if you do find yourself going off-track, don’t beat yourself up – just get back on! This weekend, the Oracle of Shadows & Light exhorts us to be kind to ourselves. It’s been a heavygoing week, energetically speaking, so lots of us having been feeling the effects of all that emotional and spiritual intensity (and even if we weren’t directly impacted, it wasn’t fun watching Screaming Susan from Accounts having that meltdown in the pantry yesterday). This oracle is for those of you who have made it a habit to deny yourselves the good things you enjoy, the sweet simple pleasures that balance out the grind of daily life. It’s good to work hard, to tell yourself that you’ll put in the effort today for a reward in the future. But at what point does telling yourself I don’t need that become a cover-up for I don’t deserve that, and how do you know if you’ve stepped over the line? I know a group of women who often do this: martyrs MOTHERS. 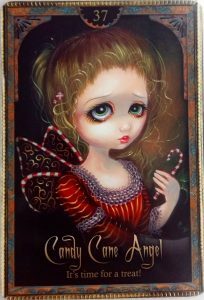 This Sunday is Mother’s Day – to all the mothers reading this, consider the Candy Cane Angel a sign to kick back, take it easy and enjoy yourself this weekend! And even if you’re not biologically a mother, think of whatever it is in your life that you’ve had to nurture and make sacrifices for. It could be family, friends, pets, a career, a personal goal… In our quest to cultivate good in our lives, we can easily overlook our own wellbeing. This weekend, let’s enjoy ourselves. Life can and should be sweet – most of the time, anyway.